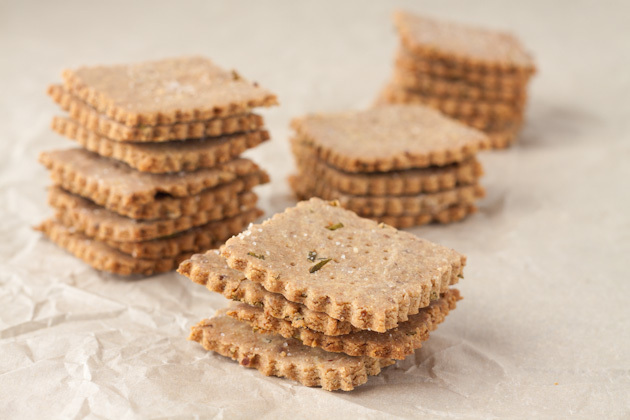 These gluten-free, vegan crackers are buttery, flaky, and perfect with a plate full of veggies and a batch of fresh hummus! Heat oven to 400F. Line a baking sheet with parchment paper or a silicon baking mat. Place all ingredients but water in the bowl of your food processor and pulse until incorporated. If you do not have a processor, a hand mixer should do the trick, too! Add water, one tablespoon at a time, allowing the processor to run for a bit until a dough forms. Continue to add more liquid until the dough holds together, but is not sticky. Similar to pie crust but a bit flakier. If you’re not sure, try pressing the dough between your fingers to test it’s perfectness. Lightly floured your clean counter top (I used white rice flour) until you’ve reached a thickness of no more than 1/4-inch thick. The thinner the better! Form the dough into individual crackers (I used 1-inch cookie cutters) and place them at least 1/4-inch apart on the prepared baking sheet. Use a fork to stab each cracker and sprinkle with salt. Bake until slightly browned, about 11-12 minutes. Remove from the oven and allow to cool on a cooling rack for a couple of minutes. 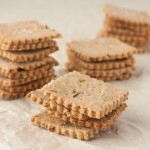 Will keep crunchy and delicious in a cookie tin or Tupperware container for a couple of days. Freezes well too! Feel free to play around with the flours. These crackers seem to be somewhat forgiving. If you don’t have tapioca, try arrowroot, or slightly less potato starch. Get creative, and have fun!